I have one card of Cha Seung Baek, from 2009 Upper Deck. Playing career: Cha Seung Baek pitched four seasons from 2004 to 2008 for the Mariners and Padres, going 16-18 with a 4.83 ERA. Where he is now: Pitching for the Orix Buffaloes in Japan. My memories: I remember him pitching against the Yankees with Seattle, and being surprised his name was pronounced BECK – I had thought it was BAKE. Google Autocomplete results: He is seventh when you type Cha Se, between Chia Seeds, referring to a plant, and Cha Seo Won, an actress. There do not appear to be any other prominent Cha Seung Baeks. Coming up next: The next profile will be Carlos Baerga. I have one card of Mike Badorek, from 1994 Fleer Excel. Playing career: Mike Badorek pitched in the Cardinals and Indians organizations from 1991 to 1997, going 50-39 with a 3.59 ERA. Where he is now: Business Sales Manager at Verizon Wireless. Google Autocomplete results: Mike Badorek does not appear in the Google Autocomplete. There do not appear to be any other prominent Mike Badoreks. Coming up next: The next profile will be Cha Seung Baek. Player Profile: Mike Bacsik Jr. I have one card of Mike Bacsik Jr., from 2000 Bowman Chrome. Playing career: Mike Bacsik Jr. pitched five seasons for the Indians, Mets, Rangers and Nationals between 2001 and 2007, going 10-13 with a 5.46 ERA. He gave up Barry Bonds’s 756th home run. Where he is now: A youth baseball coach in Texas at the D-BAT Allen academy. Interesting stories: He was fired from Dallas radio station The Fan in 2010 after tweeting about “dirty Mexicans”. Google Autocomplete results: Mike Bacsik Jr is sixth when you type Mike Bacs, between Mike Bacsik The Fan and Mike Bacsik Sr.
Coming up next: The next profile will be Mike Badorek. I have one card of Mike Bacsik, from 1980 Topps. Playing career: Mike Bacsik pitched five seasons for the Rangers and Twins between 1975 and 1980, going 8-4 with a 4.43 ERA. Where he is now: A youth baseball coach in Texas. My memories: His playing career is from before my time. Interesting stories: In 2009 he shared some baseball cardstories. Google Autocomplete results: He is second when you type Mike Bac, between Mike Backman, a former right winger for the New York Rangers, and Mike Backes, an actor. Other than his son, there do not appear to be any other prominent Mike Bacsiks. Coming up next: The next profile will be Mike Bacsik Jr.
A member of the Baseball Hall of Fame and the 3000 hit club, Lou Brock is the former all-time and single-season stolen base champion. In his nineteen-year career he was a six-time all-star and earned MVP votes in ten different seasons, finished second in 1974. He also holds several World Series records. Now a successful entrepreneur whose businesses include Business of Champions mobile marketing and the ChildSafe Online Dashboard, he kindly answered my questions about baseball cards. "Yes I collect cards. I like all the cards that are out today. They need to put in better gum!!!" Manuel "Gary" Mota Jr. played six seasons of professional baseball. In his debut season in 1992, he hit .291 with 23 HR and 89 RBI for Asheville. Unfortunately, injuries prevented him from making the major leagues. Now a private baseball instructor in Tennessee, he kindly answered my questions about baseball cards. "A friend of mine got me into collecting them @ Fullerton College (90). When I got drafted I invested 40k in cases of 89 score football, 90 baseball leaf. Tripled my money in a few years. After that, I didn't have time to collect or invest more because of my career. Had a great run. I used to enjoy the error cards back then. To this day I still wonder if the card companies printed them this way on purpose. 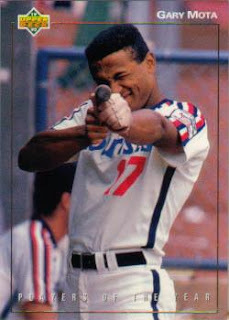 My favorite card is probably my 1992 Upper Deck Minor League Player of the Year card, in which I'm pointing a bat as if it is a rifle and the photographer took the shot. Wish I can find some of these for my son." Thanks! I don't have that card, but I do have his regular 1992 Upper Deck Minors card. Brooks Kieschnick was the first round draft pick of the Cubs in 1993, and played four seasons in the major leagues as an outfielder. He then reinvented himself as a pitcher and pitched in two seasons for the Brewers. In 2003 he became the first player ever to hit home runs as a pitcher, a pinch hitter, and a designated hitter in the same season. He kindly replied to my question about collecting baseball cards. "I used to collect a bunch. I have bins and bins of cards." I have 57 cards of Wally Backman. This one is from 1992 Topps Gold Winners. My memories: I remember him being part of the second base platoon on the 1986 Mets – Davey Johnson figured out he wasn’t good enough to be an everyday player, but useful when platooning with Tim Teufel. Where he is now: Manager of the Mets AAA team in Buffalo. Interesting stories: He is well known for being hired as the manager of the Diamondbacks in November of 2004 and being fired four days later after numerous sordid personal details emerged. He really does appear to be a pretty despicable person. He was arrested on a DUI in 1999 and admitted to being an alcoholic, then later told Sports Illustrated he only admitted to being an alcoholic to avoid jail time. He went into bankruptcy after trying to get out of paying Oregon taxes while playing for teams in other states. He blamed his financial problems on his ex-wife. Court documents reveal a different story (as well as further instances of reckless driving). Most damning is his history of violence against women. He was accused of domestic violence by his first wife, and was arrested after hitting a female friend of his second wife with a bat he used in the 1986 World Series. The women suffered a serious gash according to the police report. Backman says that in a struggles for the bat, “It barely touched her, just enough to cause the tiniest pinprick of blood.” I didn’t know you could tap someone lightly with a smooth, round baseball bat and draw a pinprick of blood. Google Autocomplete results: He is second when you type Wally, between Wally Szczerbiak, a Long Island high school basketball star who later played ten seasons in the NBA, and Wally West, the first Kid Flash and third Flash. There do not appear to be any other prominent Wally Backmans. I have one card of Brett Backlund, from 1994 Upper Deck Minors. Playing career: Brett Backlund pitched in the Pirates and Diamondbacks organizations from 1992 to 1997, going 37-42 with a 4.26 ERA. In his first season he reached AAA Buffalo where he went 3-0 with a 2.16 ERA in four starts. He never reached the major leagues or put together comparable minor league numbers again. Where he is now: A CPA in Gilbert, Arizona, he is also the 10U Manager of the AZ Xtreme Baseball Club. Google Autocomplete results: He is fifth when you type Brett Back, between Brett Backus, Account Representative at CoStar Group, and Brett Backues CPA, an accountant in Issaquah, WA. There do not appear to be any other prominent Brett Backlunds. Coming up next: The next profile will be Wally Backman. I have two cards of Brandon Backe. This one is from 2008 Upper Deck. Playing career: Brandon Backe pitched for Tampa Bay and Houston from 2002 to 2009. His regular season career was undistinguished – 31-29, 5.23 ERA, let the NL in earned runs and home runs allowed in 2008. However, he was excellent in the postseason, going 1-0 with a 2.95 ERA in six starts. Where he is now: Owner of Bottom of the Ninth baseball instruction in Alvin, TX. My memories: Was vaguely aware of him with Houston but nothing specific. Actually was half surprised he’s been out of baseball for three years. Would have guessed he was still active somewhere. Google Autocomplete results: He is tenth when you type Brandon Ba, after Brandon Barash Married, referring to an actor. There do not appear to be any other prominent Brandon Backes. Coming up next: The next profile will be Brett Backlund. I have three cards of Shooty Babitt. This one is from 1982 Fleer. Playing career: Shooty Babitt played in 54 major league games, all in 1981 for the Oakland A’s, hitting .256 with 0 HR and 14 RBI. He was fifth in the AL Rookie of the Year voting. Where he is now: Babitt’s situation is pretty unique – he actually works for two teams! He is a scout for the Mets, and an A’s TV analyst. Presumably there is not direct conflict there but it’s still pretty odd. My memories: He’s from before my time. Only know him from his card. Google Autocomplete results: He is fourth when you type Shooty, between Shootyz Groove I Train Video, a rap rock video, and Shooty Mans 3, a video game parody. There do not appear to be any other prominent Shooty Babitts. Coming up next: The next profile will be Brandon Backe. I have one card of LaRue Baber, from 1992 Classic Best. Playing career: Outfield LaRue Baber played in the Brewers and Padres organizations from 1990 to 1994. His best season was 1991, when he hit .277 with 6 HR, 41 RBI and 12 SB for the Helena Brewers. Where he is now: A repossession agent for H&H Recovery in Livermore, CA. Google Autocomplete results: LaRue Baber is sixth when you type LaRue Ba, between LaRue Baseball Player, which probably refers to Jason LaRue, and LaRue Bag, a canvas tote. Another prominent LaRue Baber owns Baber’s Creative Printing in Rowlett, TX. Coming up next: The next profile will be Shooty Babitt. I have three cards of Bob Babcock. This one is from 1982 Topps. Playing career: Bob Babcock pitched for the Rangers from 1979 to 1981, going 2-3 with a 3.92 ERA in 16 starts and 23 relief appearances. Where he is now: He went into law enforcement after his baseball career and is now retired. Google Autocomplete results: He is ninth when you type Bob Bab, between Bob Babbitt Discography, referring to a Motown musician, and Bob Babbage, a government relations consultant. Another prominent Bob Babcock played for the Washington Capitals. Coming up next: The next profile will be LaRue Baber. I have one card of Bryan Baar, from 1991 Classic Best. Playing career: Catcher Bryan Baar played in the Dodgers organization from 1989 to 1992, hitting .244 with 45 HR and 190 RBI. Where he is now: Co-Owner and Founder of Elite Baseball andSoftball Training in Grand Rapids, MI. Google Autocomplete results: The first two results when you type Bryan Baa are Bryan Baar Baseball and Bryan Baar, ahead of Bryan Baack, a University of Oregon student arrested for armed robbery. Another prominent Bryan Baar is a Sales Representative at The Pelican Group in Ontario. Coming up next: The next profile will be Bob Babcock. I have sixteen cards of Oscar Azocar. This one is from 1990 Score Rookie Traded. Playing career: Oscar Azocar came up with the Yankees in 1990 and hit .248 with 5 HR and 19 RBI. He was famous for being extremely aggressive at the plate, going over 100 plate appearances before his first walk. He holds the major league record for most career stolen bases without being caught (10). He also played two seasons with San Diego. A full account of his career can be found at The Greatest 21 Days. After baseball: Azocar died of a heart problem at La Viña Hospital in Venezuela in 2010. In May of this year, the cardiologist on call was arrested and charged with manslaughter for not giving Azocar prompt medical attention when he was brought into the hospital. My memories: I remember reading about him in Yankees Magazine as an up-and-coming minor leaguer, and thought his name was pronounced AZocar. When he was called up to the Yankees I was surprised it was pronounced aZOcar. I also remember reading that he was the only major leaguer with two cars in his name. Google Autocomplete results: The first two results when you type Oscar Az are Oscar Azocar and Oscar Azocar Cause of Death, ahead of Oscar Haza, a journalist. Another prominent Oscar Azocar is the chief of the trauma department at Hospital Dipreca in Chile. Coming up next: The next profile will be Bryan Baar. I have five cards of Bob Ayrault. This one is from 1993 Stadium Club. Playing career: Bob Ayrault pitched for the Phillies and Mariners in 1992 and 1993, going 5-3 with a 4.05 ERA in 54 games. A complete account of his career can be found at The Greatest 21 Days. Where he is now: A youth baseball coach in Nevada. Google Autocomplete results: He is sixth when you type Bob Ay, between Bob Aylward, who worked in the Mariners, Devil Rays and Orioles front offices, and Bob Ayala Joy by Surprise, a song by a country musician. There do not appear to be any other prominent Bob Ayraults. Coming up next: The next profile will be Oscar Azocar.